Since my first test drive of the Chevrolet Volt in July 2010, I have watched it outsell all other electric cars. Drivers are consistently happy with their Volts. Most use little gasoline. What I learned in the 2010 test drive is still true today…. My test drive of the Volt demonstrates why it is the best selling electric car. I settle behind the steering wheel, feel comfortable in the bucket seat, I’m impressed with the display behind the wheel, and the 7-inch navigation screen. The Volt looks and feels high-tech. In 4 laps around a mile test drive loop that included sharp turns and straightaway. While driving, I was able to try the three modes of the car with a push of the button. In Normal mode, the Volt always stayed in the quiet electric mode that gives this 4-door sedan a 40 mile electric range before engaging its 1 liter gasoline engine to provide 300 extra miles of range, depending on driving conditions. In Sport mode the Volt accelerated faster than I would need to enter any freeway, or pass another car on a country rode. In Sport, the Volt accelerates zero to 60 in about 8 seconds; not as fast as the 4 seconds when I was in a Tesla, but faster than my Nissan LEAF test drive. The Volt had a sporty feel navigating tight corners. Lithium batteries deplete faster in electric cars when driving freeways, and even faster up steep grades. The Volt also includes a Mountain mode which immediately engages the engine which is coupled with a generator that feeds electricity to the electric motor and batteries. The engine sound was subdued while I tested Mountain on my flat drive. The Volt is really a plug-in hybrid. At certain speeds, such as around 30 mpg, the Volt engine also blends power in parallel as GM vehicles can do in two-mode hybrids. GM positions the Volt not as a plug-in hybrid, but as an extended range electric vehicle (EREV) because the gasoline engine is configured in series with the generator, and because GM states that the electric motor provides all power to the wheels. When I test drive electric cars, acceleration or braking can sometimes feel jerky. On the Volt acceleration and braking is smooth. In addition to my 4 laps of driving the Volt, I got in a few more sitting in the back seat which includes 2 bucket seats. This 4-seat compact has plenty of leg room and comfort. Each backseat can be dropped to provide plenty of cargo space accessed through the hatch door for golf clubs, bags and boxes of shopping, lots of stuff for the kids, or travel luggage. 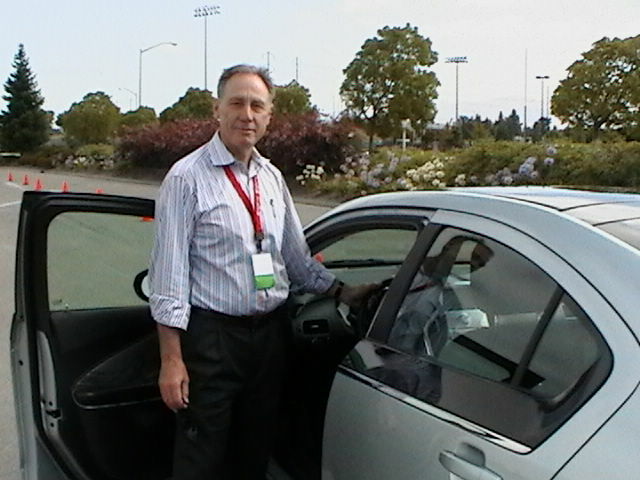 My drive is with Tony Posawatz, Vehicle Line Director for the Chevrolet Volt and GE Global Electric Vehicle Development. Tony has over 100 Volts around the road across the country being put through final paces by GM engineers, and a few out being driven by everyone from President Obama, to big fleet managers, to tech journalists like me. Chevrolet dealers are now taking orders for the Volt, starting at $350 per month, or $41,000 purchase. Thousands of orders are being made with Chevrolet dealers in launch markets for the 2011 Chevrolet Volt in California, New York, Michigan, Connecticut, Texas, New Jersey and the Washington D.C. area. Tony Posawatz said that he expects over 10,000 Volts to be delivered by the fall of 2011. Mr. Posawatz explained that by 2012, the Volt will also be available with a flexfuel engine that can support E85 ethanol blends, and an AT-PZEV. Because of the series configuration where the engine is coupled with a generator, GM has the architecture and roadmap for a number of exciting vehicles in the future. This Voltec Propulsion System was formerly called the E-Flex architecture. If it made economic sense, the engine could be a diesel in Europe, or a natural gas in Latin America. Engine and generator could be replaced with a fuel cell. GM could even produce a pure battery-electric like the Nissan LEAF. I asked Tony Posawatz, “Will GM offer a battery-electric?” While he did not answer directly, he smiled and said, “Look for a big announcement in the next six months.” For the luxury market, GM plans the Cadillac ELR with a Voltec drive system. Five years of the OnStar Plan is included at no extra charge on the Volt. OnStar has helped many a GM customer with everything from emergencies to a call center for questions. The Volt is the first GM vehicle to offer five years of OnStar Directions and Connections service, which includes Automatic Crash Response, stolen vehicle assistance and connected navigation, all standard. The Volt also comes with the GM’s Connect App which can run on your iPhone or Android. Volt owners can use a smartphone to access their vehicle’s current electric range and fuel efficiency. With the mobile app you can manage Volt charging. You can look up the battery’s charge level, check on what time your Volt will be fully charged and ready to go, or even change charging priorities remotely with just a couple of taps. You can perform other commands remotely too — like unlocking doors or activating the remote start. In the winter cold or summer heat, you can use the app to pre-heat or pre-cool the Volt. Electric car critics claim that there is only a coal power plant at the other end of charging, so you are not doing any good. The argument is false. The Volt electric drive system is about 70 percent efficient versus 15 percent for a typical gasoline engine drive. Most of the 40,000 electric cars now used in the U.S. use no coal power. 36 states have utility scale wind power, which is often most available at night. With your GM Connect App, you can program the car to always be charged by 7 a.m. and the Volt will calculate the least expensive way to charge at night, and if the electric utility communicates when extra renewable energy is on the grid. To save money, the app can load your utility rate table. It can even text you when a charge is complete or if there’s a problem with charging. I have talked with over 20 Volt owners. They all love their car. Volt Owners Experiences. I am impressed with my recent test drives of the Chevrolet Volt and of the Nissan LEAF. The Volt can be leased for $350 per month; the LEAF for $349. If you buy, you can save about $5,000 with the 2012 LEAF which starts at $35,120; the Volt now at $39,995. Buyers can benefit from a $7,500 federal tax credit, and tax credits in many states, the result of growing concerns about a nation damaged from oil spills, health problems, and energy security. Currently 95 percent of U.S. transportation is fueled by oil that is refined into gasoline, diesel, and jet fuel. I would buy the Volt if I were still in previous position at Sun Microsystems covering several states. The Volt’s 40-mile average electric range would be perfect for most days, and the plug-in hybrid would allow me to travel hundreds of miles when necessary, filling-up at the nearest gas station. Now, however, the LEAF is a great fit for my wife and me. The LEAF’s 100 mile electric range exceeds our 40 mile range need. Living in a city, we are also two blocks from transit which connects to rail, and we are two blocks from car sharing. Nissan LEAF test drive. Both the Volt and LEAF will meet all the needs of millions as their sole car, and millions more as a second car in 2-car households. Both are roomy compacts, seating 4 and 5 in comfort. Both have backseats that can drop for comfort. Both offer the latest in safety, navigation, smart apps, and entertainment.